But Dane didn't count on falling in love with her himself. Nor did he count on the front page murder that engulfed them all. Sheila, exotic young international leader of haute couture, is found murdered in her Park Avenue penthouse. Two floors down, the distinguished middle-aged millionaire - Ashton McKell - is hauled off to jail. Next to go, Lutecia, his shy patrician wife. And then Dane. Together, a triangle of murder suspects. 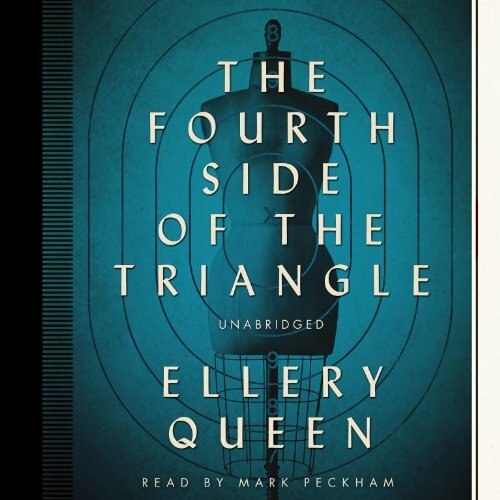 Ellery Queen, immobilized, can trick the police into becoming his "legmen" if he discovers the fourth side of the triangle before the blackmailer squeals. ©1965 Ellery Queen (P)2014 Blackstone Audio, Inc. Although we do not meet "the Maestro" until half-way through the book, the number of suspects and false leads create a wonderful mystery. Not much Ellery here, but still entertaining. Ellery doesn't even enter into the book until the 42% mark, and when he does...well, he gets a chance to try to solve a case Nero Wolfe style, as he's laid up in the hospital with two broken legs. While it's a good, entertaining mystery, this one doesn't play as fair with the reader (or listener) as Queen usually does.